Grid connected feed in tariff based MW scale solar power plants are the core strength of NanoSolars . Our Engineering team is awarded for the minimum power loss with maximum visibility at Owner end. 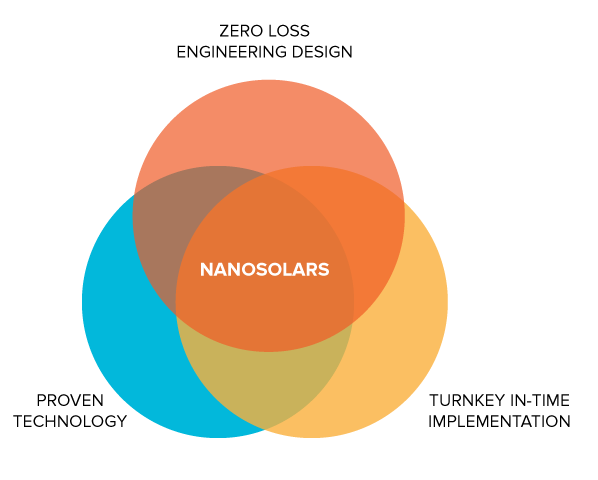 Nano Solars involves from selection of land to power feed to the conventional existing distribution grid. Grid-connected Solar PV Power System includes PV modules, grid-connected inverter, meter and power switchboard. The PV modules convert solar energy to DC power .then the grid-connected inverter converts the DC power to sine wave AC power which keeps the same frequency and phase as the grid-net power. The AC power partly feeds in the grid-net and partly supplies to local loads or family . Unused power is sold to power company. Grid-connected inverter can be widely used in residential ,roof, photovoltaic power generating architecture and large scale photovoltaic power plants and etc, both standalone network and slip inverter power distributive line ,through several inverter’s parallel operation and all inverters can be remotely monitored and controlled. We take up the 1MW and above turnkey power plant EPC (Engineering Procurement and Construction). As an EPC expert we follow the below mentioned approach to complete the projects as per the commitment given to clients. We also operate and maintain ( O & M) the power plants as per the agreements made during the award of contract.